Gender is a relational process in which roles and interdependent ideas of masculinity and femininity are reproduced or challenged: a highly relational and fluid category, and its role in water dynamics, the most “relational” of all resources, is indeed crucial, albeit generally rendered invisible. Our aim in this paper is to contextualise crucial dynamics in gender relations that flow through water, by exploring local water systems in the Middle East (Jordan and Palestine) in relation to issues of access, control, distribution and “modernisation” of water supplies. 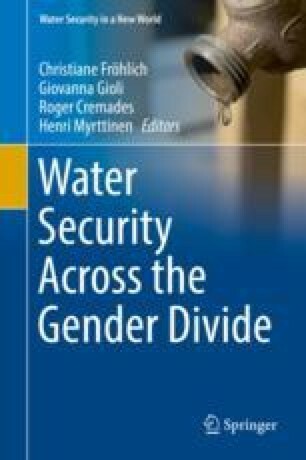 First, we examine the relationality of water and gender dynamics as they have been discussed in the anthropological literature, in terms of how aspects of the “social life” of water are intertwined with ideas and roles of femininity and of masculinity within processes of modernisation. This leads us to focus on the first of our case studies—intensive irrigated agribusiness in Jordan—as a typical example of the masculinisation of water spaces within the bureaucratic encounter. We then present and discuss two case studies in the West Bank (Palestine) concerning, respectively, women’s daily domestic water practices in a refugee camp and irrigated water in a rural village: here, water relations may only be understood in the context of the broader political arena and in light of local, mutating, ideas of family. This chapter is a joint work: Parts I, II have been written by Van Aken, Part III by De Donato. The analysis of the Jordan Valley case (Jordan) is based on a long fieldwork (1998–2003) on social practices and belonging in the “supergreen revolution” that reshaped water practices of the displaced communities who arrived in this region. The case studies in the West Bank, analysed by De Donato, are part of Master fieldwork (2009–2010) and PhD fieldwork (2014–2015) on water as political medium in social relations concerning the Palestinian nation-state building.